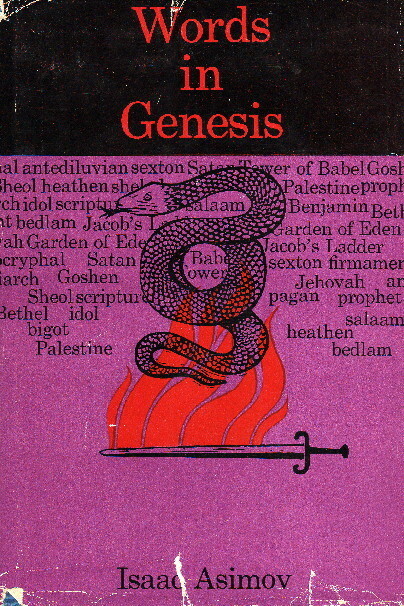 In this book Isaac Asimov retells the story of Genesis with particular emphasis on the derivations and history of the words that are associated with it, and the expressions that have become a part of our everyday language. His account, written with enthusiasm, reverence, and a lively sense of curiosity, makes a stimulating introduction and companion to the Bible itself. A complete index of words and names makes it a useful reference as well. Babel, heathen, patriarch, antedeluvian are only a few of the words whose stories he uncovers. He traces, for example, the changes in the word cherub from the mighty winged lion of the Babylonians to the “baby angels” that the name connotes today, and the equally strange transformations of Bethlehem into “bedlam.” Proper names, too, have often a hidden significance. It may surprise many to know that Palestine meant originally “Land of the Philistines,” and that James is the modern spelling for the name Jacob. But the book is far more than a language hsitory, fascinating as that may be. Even those who know their Bible well will be surprised to find that Professor Asimov’s unique approach adds a new dimension of meaning to the traditional story of creation. Well, I must admit that I enjoy this book enormously. I like the word books a lot, and I share with Asimov an interest in the Bible—indeed, he’s the one that instilled it in me. Here we have him treat the beginning of the Bible in the same fashion as he did the Greek myths in Words from the Myths: he retells the story, stopping to explain how it has had an impact on our language, or how our language has influenced the words chosen in the original to tell the story. He does a terrific job and the result is highly entertaining as well as informational. As with Words from the Myths, much of the value of the book derives from the fact that moderns are (frankly) not as familiar with the Bible as were those a century or two before us. Asimov, of course, was an atheist and had no real reason to stick to a literalist reading of the Bible. This caused him innumerable difficulties on a number of occasions, as he had to deal with long, complaining missives from overzealous readers (myself included, alas). He manages, however, in this book to be respectful towards religious feeling and avoid treading on too many toes. He is here not interested in the Bible as history, theology, or science and he does not (by and large) deal with it on that level—rather, he is interested in the Bible as a source for our literary and linguistic history, and restricts himself to that. The result is a book which can be read and appreciated from almost any theological perspective and by anyone who enjoys knowing more about the English language. On the other hand, the book has one odd limitation—it was written at the beginning of the veritable explosion of modern English translations of the Bible, and so limits itself to discussing what is said in the King James, Douay, and New Revised Standard versions. In one sense, that isn’t a problem (after all, only the King James can claim to have had a particular direct impact on the English language), but in another, it’s a bit of a shame and does have the side effect of dating the book in a particularly peculiar fashion.